Bushman Equipment, Inc. manufactures drum tilters and drum handling equipment that holds drums securely during pick up, movement, and discharge operations. Each ergonomically designed lifter permits precise rotation, from the vertical to the horizontal plane and beyond, for controlled pouring and dumping. 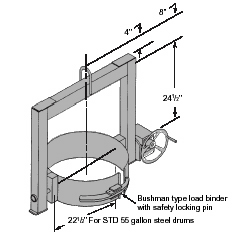 All Bushman Equipment, Inc.’s drum handling units meet or exceed the requirements of the latest revisions of ASME Specifications B30.20 and BTH-1, Design of Below-the-Hook Lifting Devices. Each unit has a 3 to 1 safety factor, based on the yield strength of the material. This protects the operator, drum and its contents. The self-locking worm drive speed reducer holds the drum in position without roll-back. In addition to the standard features described below, most Bushman Equipment, Inc. drum tilters can be modified for a variety of different drum sizes and types including those frequently used for hazardous materials. This 55 gallon drum tilter or rotating drum lifter enables the operator to pick up and move drums and dispense their contents accurately. This model includes a quick release chain load binder that simplifies drum engagement and disengagement. The ergonomically designed rotation mechanism includes a self-locking gear reducer actuated by a hand wheel. An optional chain wheel permits rotation of the drum when the unit is beyond the operator’s reach. The standard model 770 works with 55 gallon drums. These units can be modified to handle a variety of drum styles and sizes except for fiber or plastic drums. The model 771 is a heavy duty drum lifter designed to manipulate drums in high production areas. 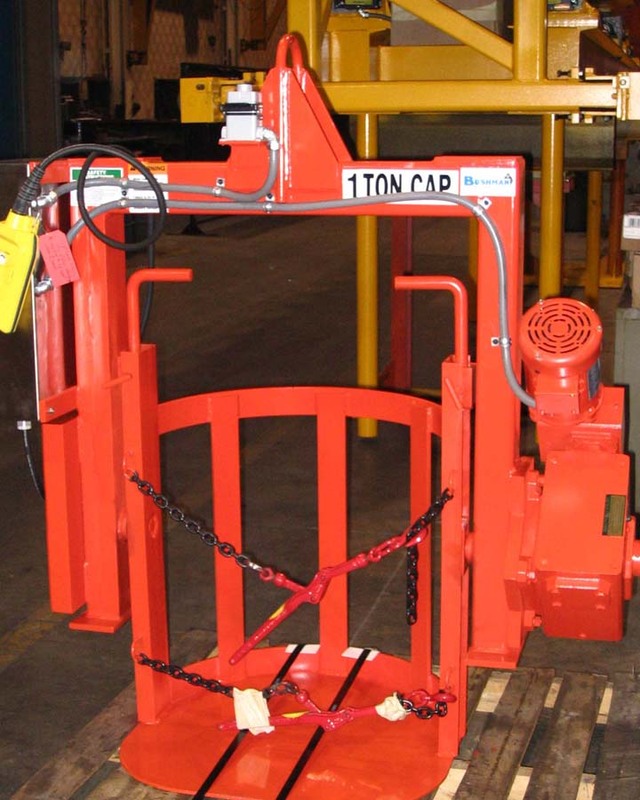 While similar to Model 770, this unit includes a solid steel band and lock mechanism in place of the chain load binder. This steel band maintains the integrity of the drum by increasing surface contact between the drum and the lifter. It also holds the drum more securely and provides greater control during pouring. This model is equipped with an ergonomically designed rotation mechanism actuated by a hand wheel with a self-locking gear reducer. 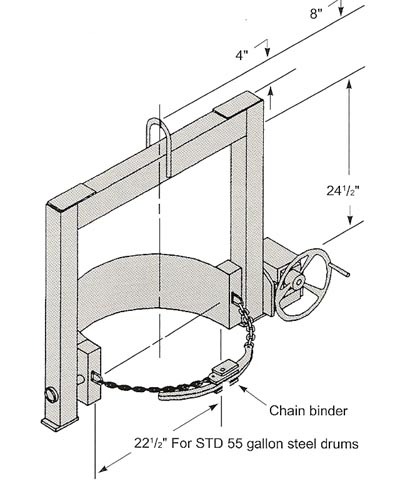 A chain wheel option is available to permit rotation of the drum when the unit is beyond the operator’s reach. The standard model 771 is designed for 55 gallon drums, but it can also work with a variety of different drum styles and sizes. Motorized rotation is available with the Model M771drum lifter. This feature provides greater handling ease and more precise positioning for pouring and dumping. It is also an important safety feature since it frees the operator from the necessity of working in the immediate vicinity of the discharge operation. Standard units are available with the following voltages: 230-460/3/60 and 110/1/60. Air operated versions are also available. The model 775 rotating drum lifter employs a cradle assembly to support the weight of the drum. 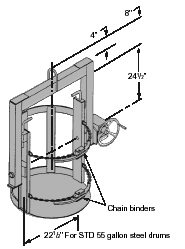 Two chain binder assemblies hold the drum in the basket during rotation. This design permits the unit to hold the drum securely and ensures precise positioning without relying on a pressurized clamping or engagement mechanism. 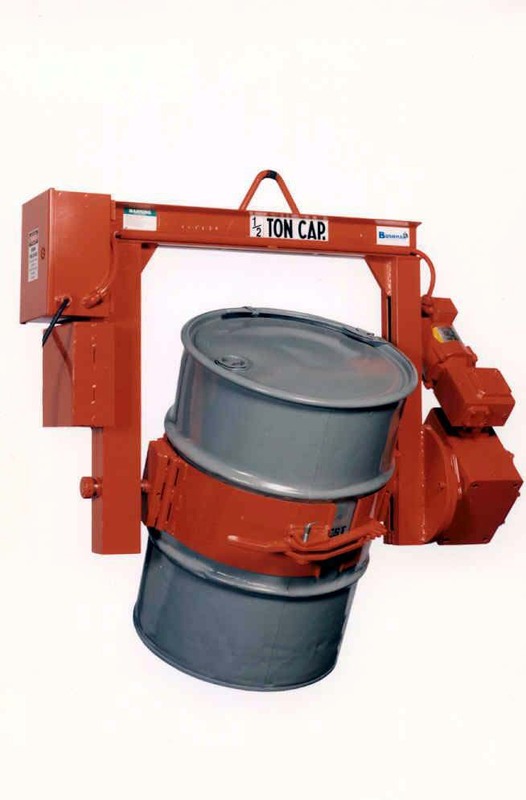 Model 775 lifters accommodate a variety of drum sizes and styles, including plastic and fiber drums. Model 775 lifters are particularly useful when handling drums that are damaged or that cannot withstand high compression engagement. Choose this model whenever the outside surface of the drum will not permit proper engagement by clamping alone. 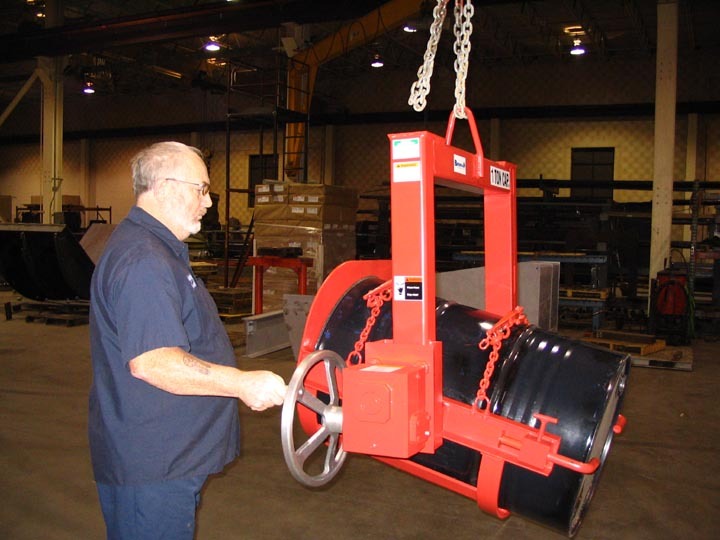 Motorized rotation is available with the model M775 drum lifter. This feature provides greater handling ease and more precise positioning for pouring and dumping. It is also an important safety feature since it frees the operator from the necessity of working in the immediate vicinity of the dumping operation.